The Art Of... Cake Decorating | The Art Of | Kids VT - small people, big ideas! Exchanging sweet treats — from simple, heart-shaped sugar cookies to pink whoopie pies — is one of my family's favorite ways to show love. 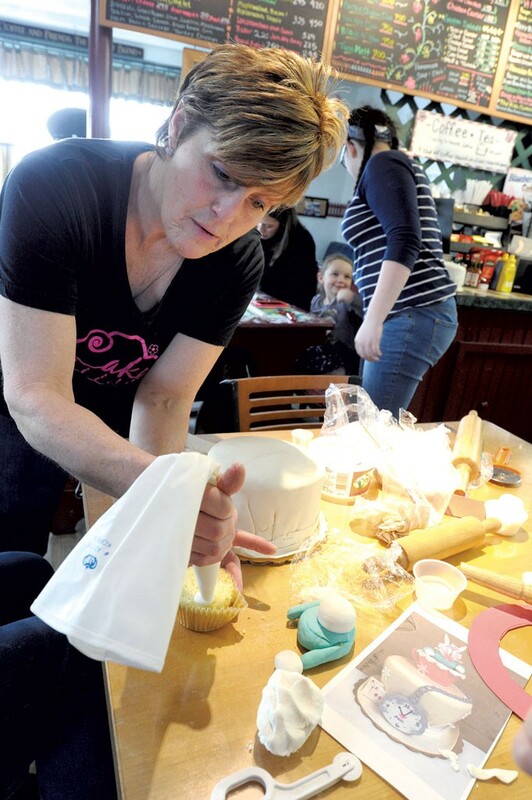 Last month, we headed to Deb Papineau's monthly cake-decorating class at her café, Deb's Place, in Morrisville, to learn how to create a dessert that's just as nice to look at as it is to eat. The day we visited the cozy bakery, around two dozen people of all ages and skill levels were there for the same reason: to decorate a premade, six-inch vanilla cake in a fancy Alice in Wonderland theme. It's helpful to set expectations before you start decorating. Several parents at the workshop stressed the importance of being patient and abandoning perfectionist tendencies. In essence, focus on the process, not the product. "Start small and build on what kids can actually achieve," advised Kathy Cookson of Morristown, who had attended several classes prior. Papineau said it's also important to give guidance. In the class, she displayed one of her cakes as a model. "Some of the cakes don't even look like mine at the end," she said, "but it's great for them to have a starting point." Side projects for the littlest ones are good, too. 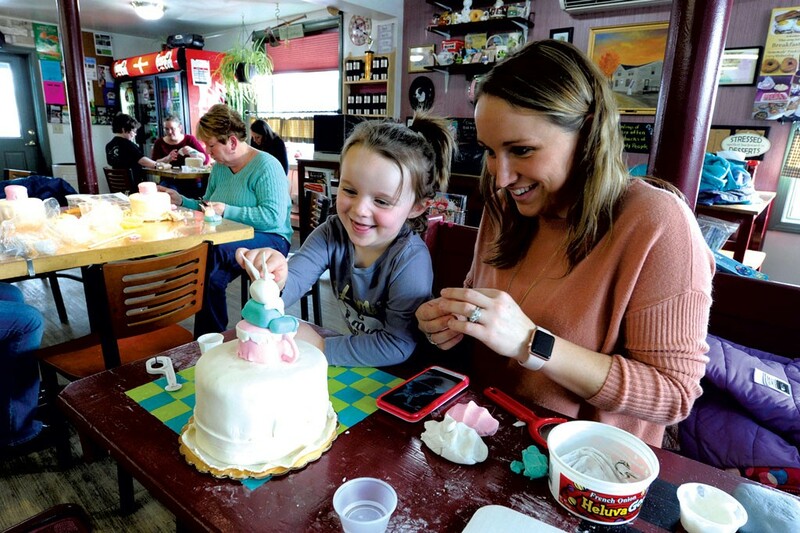 Morristown resident Jaimie Welcome, a veteran of six cake-decorating classes, told me she often works on a masterpiece cake with her 6-year-old, Annabelle, while her 3-year-old daughter, Caroline, decorates her own cupcake. Following her advice, my younger daughter, 4-year-old Pippa, busied herself making her own flower creation while my husband and older daughter worked on the cake. Papineau uses three types of frosting to create her impressive cakes. Her confections are first coated with buttercream frosting, then covered with a base layer of thinly rolled-out fondant to create a blank canvas for the decorator. The easily moldable fondant — popular because of its smooth, finished look — can be sculpted into different shapes. Adding a little water makes it sticky, while a bit of cornstarch makes it less so. If it dries out, a dab of Crisco softens it. "This has to be the most forgiving stuff there is," Papineau said of the fondant. She purchases larges tubs of the icing for classes but notes that there are lots of easy online recipes. Finishing touches are accomplished with royal icing. The hard white frosting is made by mixing beaten egg whites and powdered sugar, or, as a substitute, by melting white chocolate chips. This edible adhesive is used to attach trimmings and add a decorative element. For structural support, Papineau uses popsicle sticks, small wooden dowels and plastic straws to prop up decorations and stiffen shapes into place. Jaimie and Caroline Welcome molded white fondant between their fingers, wondering aloud how to make rabbit ears. "We were thinking it had to be thick so it would stand up," Welcome said as Papineau approached. "Nope," the baker said, grabbing a rolling pin. "Roll it out thin." She flattened down the fondant, wrapped it around a toothpick and molded it into the shape of an ear. Covering cakes with fondant can result in tears and folds. Papineau suggests strategically placing decorations to cover them up. Also, cupcakes affixed on a cake can create platforms for small scenes or be made into decorative features. 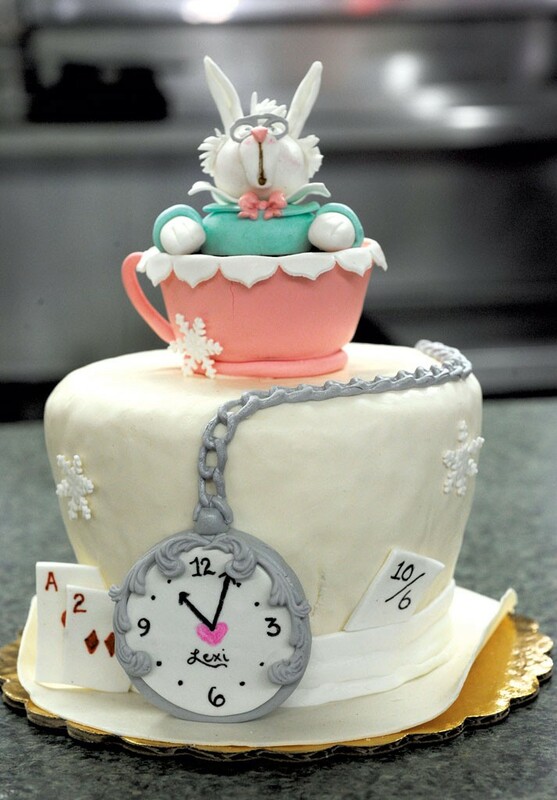 On Papineau's Alice and Wonderland-themed cake, for example, a pink fondant-covered cupcake turns into a teacup. Don't have all the specialized materials you need to make a fancy cake? Use these common household items instead. Use a pizza roller in place of an expensive fondant cutter, or cut fondant with kids' scissors. Grab a kids' paintbrush to apply water to the fondant. Use cookie cutters in place of fondant cutters. Fill a piece of pantyhose with cornstarch to form a ball and use it to apply starch evenly to hands and work surface. Papineau's next class is Sunday, February 12, from 10 a.m. to noon. Participants will make a Valentine's Day-themed cake. For more info, call 888-6886 or visit debsplaceinfo.com.